It seems like I have always had a fondness for the moon. I am captivated by it's beauty, especially when it's a full moon. 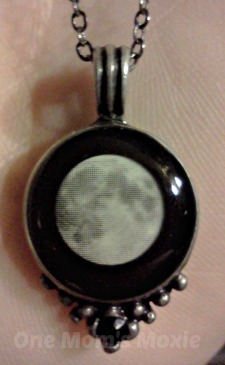 So when I saw the site Moonglow I knew I would love any piece of Moon jewelry that was sent to me. Every piece is handcrafted and made-to-order by the artist, Luc Rouleau. If you haven't heard of this spectacular jewelry I am excited to share with you all my review of the piece I received. I received the original Moonglow model that was designed in 2003 and I absolutely LOVE it! I think every single person I have showed it to has wanted one for themselves. The fact that the moon actually glows in the dark is just awesome. When you go through the site I highly recommend you go through it thoroughly because there are so many wonderful pieces. On every piece of Moon jewelry you are able to choose a date that is significant to you, it is called the Moon phase. When your Moonglow jewelry piece arrives it comes with a card with the date written on it as a keepsake for you. I chose a date special to me and my husband, plus I wanted a full Moon because I just love a full Moon. This is what my moon necklace looks like while it's glowing. It looks really neat when it's really dark in the room or while you are outside. The Moonglow site also carries bracelets, earrings, watches, rings and Moonglow pieces for men as well. One lucky One Mom's Moxie reader will win a Moonglow piece of their own!! I would choose new moon or full moon. I think I like new moon better. I would choose the Venus its very pretty.